Canvas Exam Analytics To learn about student performance and to evaluate the effectiveness of individual exam questions. Easy Movie Maker (free) for Windows 10 One way to create and edit videos, from a webcam, or from video clips recorded on a camcorder or cell phone, is this free solution from Microsoft: Easy Movie Maker. See the 7 minute walk-through from a first-time user. Create Group Assignments in Canvas Once a group of students has been created in Canvas, the instructor can set up an assignment to be submitted by groups. The steps are shown in the screencast. A Simple Method for Distributing Students to Groups in Canvas The simplest way to create groups in Canvas is to randomly distribute students into the number of groups you set up. The screencast shows how. Embed an Office Mix into the Rich Content Editor in Canvas Office Mix has been retired by Microsoft. For information about recording Powerpoints, please turn to Recording a Powerpoint for Web Access. Create closed captions for a video on your own For videos uploaded or recorded directly to Canvas, there is a way to create closed captions if you have excellent keyboarding skills. This 6-minute demonstration shows the steps. Demonstration of Creating Closed Captions for a Canvas Video from Academic Technology on Vimeo. 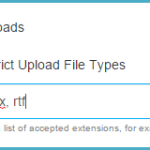 Restricting File Types requires Perfect Typing When you are setting file types for assignment submissions in Canvas, you must be letter perfect in your typing if you are going to restrict those file types to, for instance, Word documents (“docx”). The demonstration here goes into further detail.